When we first immigrated to Australia all our furniture was donated from the local church and Mum, Dad, my two older sisters and I, used to sleep in one big bed, sideways, so we could all fit. Luckily we were a short family! ‘Sha’ because my little niece couldn’t pronounce my name. Like Tobias Eaton from Divergent I have a terrible fear of heights. I went sky-diving to cure me of it. It didn’t work and have only sky-dived the once. Odd-ball. Twisty. Thought-provoking. Cheeky. Humorous. Light. Uplifting. Affirming. Empowering. Playful. Tenacious. Passionate. Quirky. Optimistic. Daring. I think if it was just for a little while I’d want to be Jet Tierbert. My mum remembers me singing into a hairbrush in front of the mirror when I was little, and after all, doesn’t everyone harbour a secret fantasy to be a glamorous Rock Star? I’d visit 2115 because I’m really curious about where the human race will be in one hundred year’s time. There are a lot of dire predictions about the deterioration of the environment, wildlife population numbers and the dominance of technology. I’m hoping subsequent generations will do a better job than us and create a more sustainable and harmonious future. Woah, can I try on your cool shoes?! Lots of authors cite their favourite books and authors as their biggest influences, and that’s true for me too... to an extent. But I was also a HUGE fan of television and over the years TV shows like Batman and Robin, Get Smart and Monkey exerted their influence on my impressionable mind. When I write, therefore, it’s very visual; I actually imagine the narrative as slapstick comedy action scenes embedded with comic-book exclamations like Whack! Biff! Crash! And my favourite, Zowie! The very first person who started me off was my primary school librarian, Mrs Carr. I was only allowed to borrow a beautifully illustrated picture book for a second week, on the proviso that I wrote a story to go with the pictures. I desperately wanted that book, so I did. I haven’t looked back since. Firstly, I have to mention that my favourite authors are Katherine Applegate, Tracy Chevalier, Kate Dicamillo, Hilary McKay, A.A. Milne, Pat O’Shea, and Michelle Paver. As a reader, I am drawn to writing which is lyrical, humorous and thought-provoking with a refreshing perspective. As a mother, I always ask myself: What will my children get from this book? What lessons will they learn? Will it challenge their ideas? Are they a better person for having read it? And all of these authors meet this criteria as well as having a really powerful story to tell. BUT, if I could only pick one (?!) to last me for the rest of my life, then it would have to be Winnie the Pooh by A.A. Milne because its message of friendship and growing up is so poignant and bittersweet, that it would be a good, grounding reminder to treasure what’s truly important. 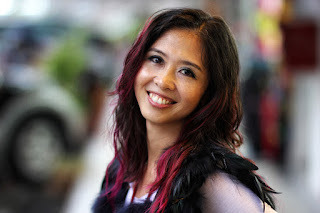 Poppy Inkwell is an Australian writer originally from the Philippines. 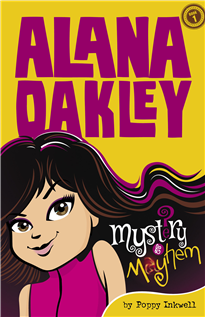 She is the author of the Alana Oakley junior fiction series, published by Big Sky Publishing. 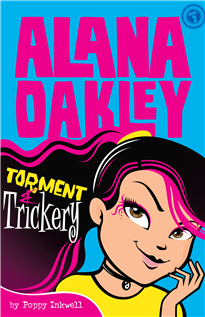 The first book in the series, Mystery & Mayhem, is currently available with the second book, Torment & Trickery, to be published in July 2015. Visit Poppy's website and Facebook page for the latest updates on her books and other creative projects.